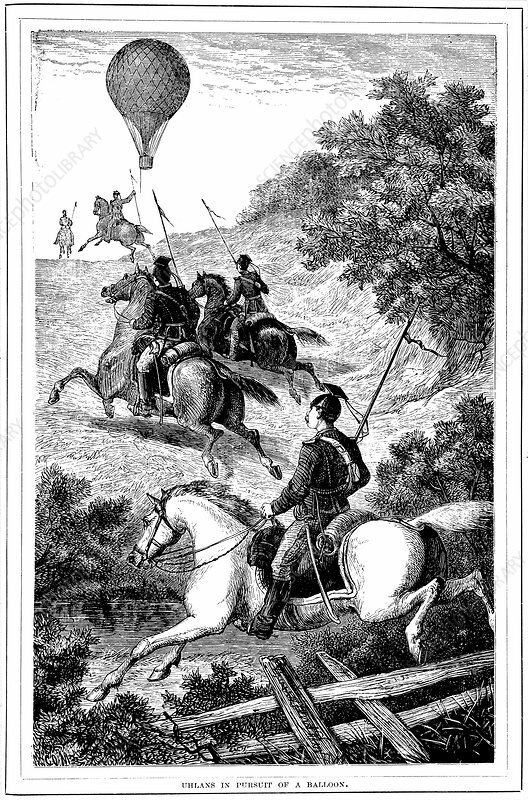 Uhlans in Pursuit of a Balloon', Franco-Prussian War, 1870-1871 (1881). A group of Prussian cavalry giving chase to a balloon which had escaped from the besieged city of Paris. After the disastrous defeat of the French at Sedan and the capture of Napoleon III, the Prussians surrounded Paris on 9 September 1870. The city held out despite famine and great hardship until 28 January 1871. Balloons were used to send messages out from the besieged city, and on 8 October 1870, Leon Gambetta, one of the leaders of the French government, escaped from Paris in a balloon, flying to Tours to try to rally support in the provinces.